Linacucina Brings Italian Inspired Cakes and Baked Goods to Raleigh! 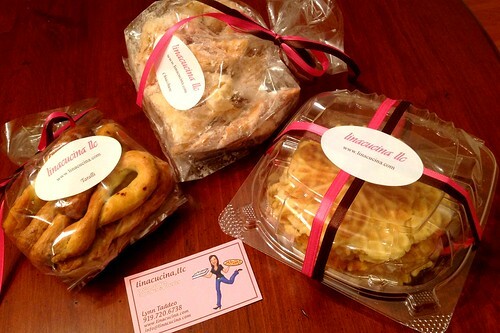 Linacucina, a local bakery specializing in Italian inspired baked goods was founded by Raleigh resident Lynn Taddeo. Lynn grew up in Montreal as part of a large Italian family and has many fond childhood memories of spending time in her mom’s kitchen watching her relatives bake. When Lynn moved to Raleigh she missed her food and traditions and decided to bring those Italian specialties to the Triangle. Linacucina specializes in custom order cakes, cupcakes, pastries and wedding favors. 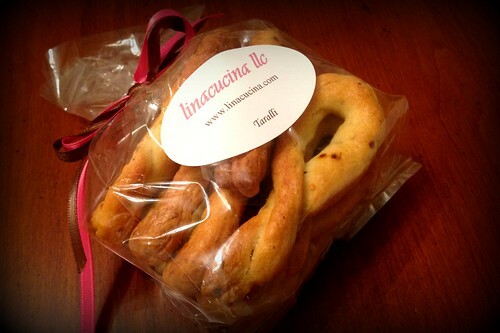 I recently received a few samples of goodies from Linacucina and they were so yummy I wanted to share my review. I should point out that my family owned and operated a wedding reception hall in New Jersey for over 50 years. I started working there as a dishwasher when I was just twelve years old and continued to work there as a bartender through my college years. During that time I have had my fair share of wedding cakes and Italian pastries. With that little qualifier out of the way, I’ll get right to it. Linacucina ranks right up there with the best of them! Of the three samples I tried I particularly enjoyed the Pizelle (pictured above). 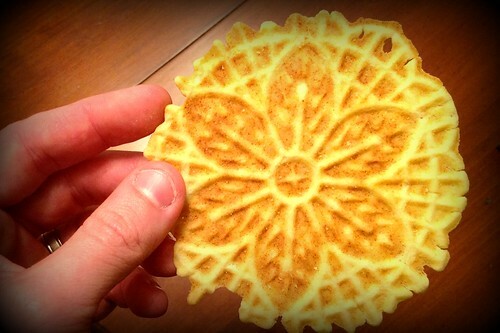 A Pizelle is best described as a simple waffle cookie. Tradition is to make them with anise (giving them a hint of liquorice) but Linacucina’s Pizelle are made with vanilla which I liked even better. These cookies are thin and light, but have a great buttery and vanilla flavor. They are pretty much melt in your mouth good and can be enjoyed as a stand alone treat, but I also enjoyed nibbling on one while I had a scoop of vanilla ice cream. 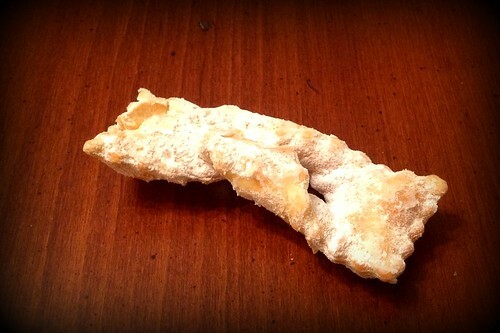 Chiacchiene is a lemon scented fried cookie with powdered sugar. These cookies were incredibly light and airy. Although they are dusted with powdered sugar they are not overly sweet. In fact I found that the sweetness of the sugar and hint of lemon compliment each other very well. There were several Chiacchiene in the sample bag sent to me by Linacucina and I shared them with my wife (these were her favorite). We found them to be the perfect treat to enjoy with our evening coffee and tea. Taralli is an Italian hard bread sick make with anise and chili flakes. They are known by some as an “Italian Pretzel”. These were my absolute favorite of three samples I tried. The mild spiciness of the chili flakes was unexpected and made for a very tasty flavor. I also liked how the pretzels were firm and crisp, while not being too hard. I have aconfession to make about my experience with the Taralli as well. They were so fresh and tasty when I first opened the sample bag that I ate them all in one sitting before I had the chance to take a picture of one of them close up! All in all I really enjoyed all three samples of the baked goods from Linacucina and highly recommend them for people looking for locally made baked goods for their next wedding or party. The samples I received were packed in nice little gift bags and containers with ribbon which would make for great wedding favors. As I mentioned above, Linacucina also creates custom wedding cakes and cupcakes for wedding celebrations. To view photos of her wedding cakes and the other baked treats check out the Linacucina website and facebook page. You can also find a selection of their tasty treats for sale at the Electric Beanz Coffee shop in Raleigh.